It didn’t take long for me to realize that I have not lived a complete life. I have jumped out of perfectly good airplanes nearly 3000 times, survived combat, and 30 years of marriage to the same person. I’ve also driven a Ferrari around the Nurburgring, raced a Lamborghini around the road course at Daytona and even hugged Mila Kunis (although her gentle pats on the back while doing so served to remind us that we were, and always will be, firmly in the friend zone). The point is that I have lived a very full life, especially when it comes to cars (and meeting celebrity crushes). At least that’s what I thought. Thus, it takes very little to surprise me. I can get into just about any car and relive a previous experience, set up a car quickly, Bluetooth, radio presets, seating, so forth and drive. However, recently I was surprised, very surprised. I own a Mazda. A 2010 Mazda3 to be exact. In fact that’s one of my most asked questions, and I’ve never hidden that nugget of info. Yet, in the years of doing car reviews I have never had the chance to actually test one. There’s no good reason, it’s just worked out that way. A new press car service (a concierge paid by auto manufacturers to facilitate weekly delivery of new cars), came on board this past week though and for the first car, delivered me the 2016 Mazda MX5 Miata. After our very first drive with it, all we could think was “oh Mazda where have you been”. My week spent with it had March days that those of us who live in Florida dream about. Perfect skies and temperatures for top down driving. Normally we live in an almost eternal tropical summer. We run from one air conditioned cocoon to another and usually end up dripping with sweat. That’s part of living in Florida. Just like one doesn’t move to Alaska to escape a brutal winter, you don’t move to Florida to see snow and chop firewood. There are however those few short weeks a year when the weather is perfect and top-down driving is nothing short of glorious. So it was for the week with the MX-5 Miata. 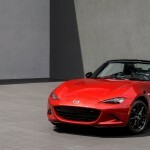 And that’s a very good thing, because the MX-5 is meant to be driven with the top down. With the top up the cabin is somewhat cramped, confined. 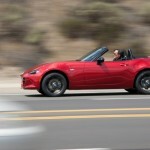 However, with the top down, the MX-5 Miata becomes near driving perfection. 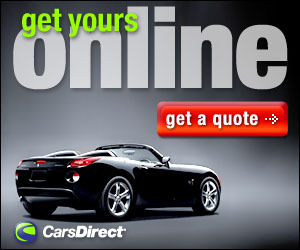 The Miata is an iconic little sports car that has legions of fans around the world. 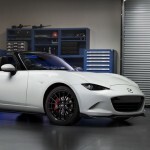 First introduced in 1989, the 2016 model debuts the fourth generation of the roadster that has shown it can compete against the likes of Spiders, MGs and Triumphs. Even before getting behind the wheel you know you are in for a great driving experience. You have to like a car where an automatic transmission is optional, and that was our first first sign of the fun ahead. Sure you can get a six-speed automatic, but it’s an option and you’ll pay over $1000 for that privilege. The two-seat roadster is offered in three trim levels: Sport, Club and Grand Touring. 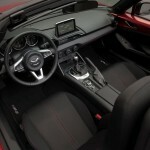 Standard on all MX-5 models are air conditioning, push-button starter, a manual cloth convertible top, power door locks, USB input, Bluetooth wireless phone pairing and audio streaming, leather shift knob and CD player. 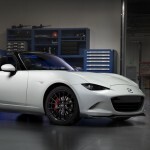 MX-5 Sport models come equipped with 16-inch wheels with 195/50R16 tires, cloth seats, a six-speaker audio system with an auxiliary jack and cruise control and keyless entry as standard when optioned with the automatic transmission. Moving from the entry MX-5 Sport gives you the option of two unique trim levels: the performance-focused MX-5 Club and the more luxury oriented MX-5 Grand Touring. 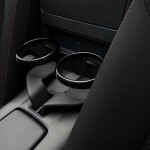 Club models come with 17-inch wheels with 205/45R17 tires, a limited-slip differential on SKYACTIV-MT models, Bilstein shocks, front air dam and rear lip spoiler, a shock tower brace on SKYACTIV-MT models, piano black side mirror covers and seat back bars, MAZDA CONNECTTM infotainment system with seven-inch color touchscreen display and voice commands, multi-function commander control, HD radio, two USB inputs, smart keyless entry, a BOSE nine-speaker audio system with headrest-mounted speakers and SiriusXM satellite radio. 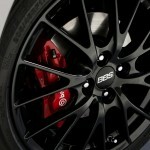 As an option you can add the Brembo/BBS package which adds lightweight, forged 17-inch BBS wheels, Brembo front brakes with red-painted calipers at all four wheels, a rear bumper skirt and side sill extensions. 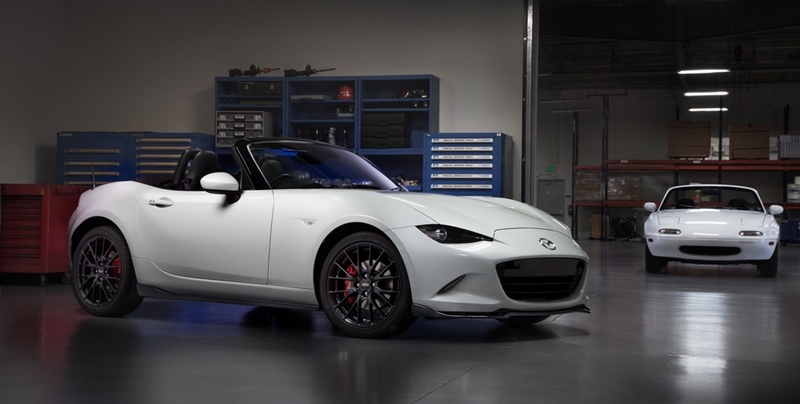 The MX-5 Grand Touring model comes with bright 17-inch wheels shod with 205/45R17 tires, leather-trimmed seats, automatic climate control, a nine-speaker BOSE audio system with headrest-mounted speakers, Homelink garage door opener, HD radio and SiriusXM satellite radio. It also comes with Mazda’s i-ACTIVSENSE suite of safety technologies, including blind spot monitoring, rear cross-traffic alert, adaptive front lighting, lane departure warning, high beam control and rain-sensing wipers. Our model for the week was the Club model optioned with the Brembo/BBS package and the rear bumper skirt and side sill extensions. Meteor Gray with a black interior the eye-catching design had us eager to get on the road. Prior to the drive getting in was no chore and we noticed that we needed very little adjustment to find the right driving position. That’s because those clever Japanese designers actually sculpted the car starting from the driver’s seat outward and that attention to detail is evident. While the seats have no height adjustments, moving the driver’s seat forward actually raises it up by an inch, a perfect fit for drivers who may be shorter and need to move forward, and up. The other nice surprise was getting the top down. It seems like every other convertible we have had requires electricity and a seemingly agonizing amount of time for the roof to retract and stow. 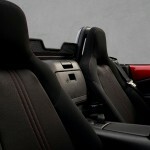 The manual roof in the Miata however only needs a quick snap and a push back to stow. Two seconds, that’s right, two seconds was all it took to get the top down, three to get it snapped back in place. One of the other surprising things; the weight of the 2016 MX-5 is actually down from the previous generation. 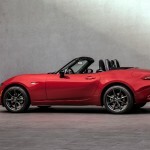 The new MX-5 is just over 150 pounds lighter than its predecessor, no small feat considering that many times a new generation of car will have new gadgets and such that add pounds. In fact, the new Miata is 155 pounds lighter than the carbon fiber Alfa Romeo 4C, previously the lightest car we had driven. Under the hood there is a 2.0-liter four-cylinder engine rated at 155 hp and delivering a 148 pound-feet of torque. As mentioned, a six-speed manual transmission is standard and we were glad for it. On the road, with the top down there is very little not to like. The new electrically assisted steering felt nice and firm and unlike the 4C , bumps in the road were hardly felt. The manual transmission shifted easily with short throws and it wasn’t long before we were smiling, cruising and having a blast. We did 0-60 in near 5 seconds and if we had better shifting skills have little doubt the 4.9 area could be reached. Unlike some of the other roadsters we’ve tested, the visibility was excellent, the ride smooth and power more than adequate. Even the fuel mileage was impressive. A week spent tooling the highways and side roads (especially the twisty ones) with a heavy foot gave us 30 mpg without even thinking about saving fuel. The final surprise comes with the price. 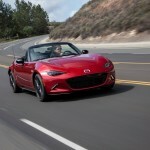 A base Sport Miata carries an MSRP of $24,900, the Club $28,600 and the top of the line Grand Touring, $30, 065. Our tester for the week optioned out at an MSRP of $32,000 and in our opinion is worth every penny. And that’s part of the appeal and success of the Miata; a fun driving experience, Mazda reliability all at an affordable price. As with all roadsters, you won’t have something that will carry a lot of groceries, more than one kid to a soccer game, or be practical for much else. What you will have is something that is a hell of a lot of fun to drive, and won’t leave you broke at the end of the month. 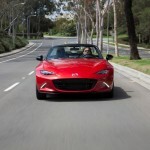 We were impressed all week with the Mazda MX-5 Miata. 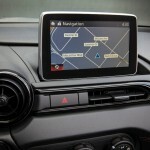 We took the long way to every destination, and were sorry to see our tester go. 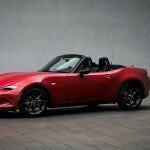 Long live the roadster as Mazda says in its press release announcing this new generation of Miata. 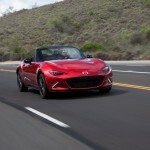 With all the fun and affordability in the MX-5 Miata, there is little doubt that this roadster will be alive and on the road for many years to come.